Edmontosaurus skull. Edmontosaurus annectens. Dinosaur fossil replica. Hadrosaurid duckbill. Dinosaur of Cretaceous Alberta, Western Canada. Royal Ontario Museum of Natural History. 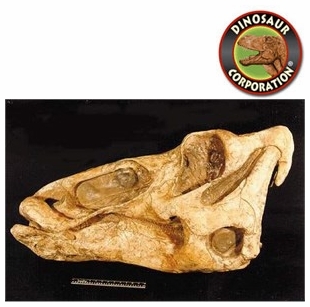 * Material: Museum quality fossil replicas are cast in durable polyurethane resins. Edmontosaurus (after where it was found, in Southern Alberta in what used to be called "Lower Edmonton" in the Horseshoe Canyon Formation, Alberta, Canada and Greek sauros meaning lizard) was a hadrosaurid dinosaur genus from the Maastrichtian, the last stage of the Cretaceous Period. Depending on the species, a fully-grown adult could have been up to 9 meters (30 ft) long. Its weight was in the region of 4.0 tonnes (4.4 short tons), making it one of the largest hadrosaurids. * Time: Late Cretaceous period, 71-65 million years ago.